MEXICO CITY — It started with a burst of gas through the drilling well. Workers scrambled to close the safety valves but within moments the platform caught fire and collapsed. Tens of millions of gallons of oil gushed into the Gulf of Mexico. Numerous attempts to stanch the spill failed. Three decades later, the 1979 Ixtoc disaster remains the Gulf’s — and the world’s — worst peacetime oil spill. The parallels between that disaster and the current BP oil spill offer sobering lessons. There were no quick fixes for Ixtoc: It took 10 months to stop the leak, with Mexico’s state-owned oil company, Pemex, trying methods similar to those that BP has attempted at its Deepwater Horizon rig. Pemex managed to slow the spill a little using several methods including forcing metal spheres into the well. But it couldn’t stop the leak until two relief wells were drilled — and even that didn’t work right away: the oil kept gushing for another three months after the first well was completed. In the end, Ixtoc spewed a record 140 million gallons of oil. Massive slicks reached the northern Mexican Gulf coast and Texas, where it would eventually coat almost 170 miles of U.S. beaches. But the most tragic thing about Ixtoc may be the lessons not learned. After the oil stopped gushing and crude was no longer washing up on beaches, funding for research largely dried up and the oil industry missed an opportunity to study the disaster and apply what it learned to future offshore drilling endeavors, said Larry McKinney, the director of the Harte Research Institute for Gulf of Mexico Studies at Texas A&M University. So far, Deepwater Horizon has spilled an estimated 21 million to 45 million gallons of oil. BP managed to place a funnel-like cap on the well late Thursday with the aim of pumping some crude to the surface, but it was too early to tell if would work or how much oil they could collect. If the Pemex disaster serves as a precedent, the BP spill could continue even after the two relief wells are expected to be finished in August. By then, it could surpass Ixtoc as the worst oil spill in history, said Tad Patzek, chair of the Petroleum and Geosystems Engineering Department at the University of Texas-Austin. The BP spill, at a depth of nearly 5,000 feet, is proving more complicated to choke off than Ixtoc, a shallow-water rig about 150 feet deep. The Ixtoc well could be accessed directly, while the Deepwater spill must be combated remotely, using robots to wield clamps, saws and other tools while monitoring the action by video feed. Most recently, BP tried to stop the gusher by pumping in heavy drilling mud and cement. The tactic, called a “top kill,” had never been tried 5,000 feet underwater. It didn’t work. The good news is the Ixtoc experience suggests the Gulf of Mexico has natural properties that help it cope with massive oil spills, scientists say. Warm waters and sunlight helped break down the oil faster than many expected. Weathering reduced much of the oil into tar balls by the time it reached Texas. Two decades after the Ixtoc disaster, marine biologist Wes Tunnell sank his diving knife into an area where he had spotted a tar patch just after the spill. The blade came out black and tarry but the hardened surface of the patch was under sand, shells and algae that had completely covered it. The Gulf has also long dealt with oil that naturally seeps from the seafloor. Some experts estimate that tens of millions of gallons seep into the Gulf from natural up-wellings each year, fostering large populations of oil-eating bacteria and microorganisms. However, it is unclear how much any of that will help this time around. The Deepwater spill is closer to sensitive coastlines than Ixtoc was. And it is affecting Louisiana marshlands that are more sensitive than the more sparsely populated Texan and Mexican coastlines that Ixtoc reached. The depth of the BP spill could also complicate the Gulf’s ability to cope. The oil-eating bacterial populations are located mainly on the surface or near shore, where the Ixtoc oil appeared. BP has tried to break up the oil deep underwater, pumping chemical dispersants directly into the damaged well. That could be a mistake, McKinney said. While chemically dispersing the oil keeps the spill less visible and ugly than Ixtoc, it prevents the oil from floating up to the surface where wind, waves, bacteria and sunlight could help break it up, he said. And some environmentalists question the safety of the dispersant itself. Pemex estimates that about half the Ixtoc oil may have burned away in the rig fire that lasted months. About a quarter dispersed and the rest was either recovered or evaporated. Ixtoc threatened coral, sea turtles, shrimp and commercially valuable fish. Some species have rebounded while others have drastically declined. Jack Woody, a retired officer with the U.S. Fish and Wildlife Service, was in northern Mexico a month after the Ixtoc spill, leading the U.S.-Mexico effort to save the Kemp’s ridley sea turtles. He watched as the oil slick closed in and tar balls began washing up at the Rancho Nuevo beach, the only significant nesting ground for the female turtles, which had dwindled to a population of about 300. Hatchlings were just emerging, and helicopters desperately tried to ferry the baby turtles to open ocean beyond the slick. “I thought we were too late,” Woody said. The turtle population continued to dwindle until 1988 but has since rebounded to up to 12,000, due in part to programs to relocate hatchlings to safer beaches in Texas and cut down on turtle deaths in shrimp nets. “I was wrong. This is the one time I like to be wrong,” Woody said. Scientists say it is difficult to know how much long-term damage Ixtoc caused because it is hard to separate the effects of the spill from overfishing, sediment, runoff and other pollution. 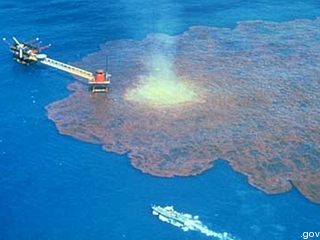 Tunnel said his students saw coral islands ringed by oil “like black doughnuts” after Ixtoc. Many of those islands have since lost most of their coral cover but Tunnel could not say whether the spill was to blame. Other causes, he said, could include overfishing of coral-friendly fish, coral collecting and sewage. After five years or so, the tar mats on Texas beaches largely disappeared, probably broken up and swept seaward, and Ixtoc was largely forgotten for 30 years, until another explosion on an offshore oil rig in a different part of the Gulf. This entry was posted in Ixtoc Oil Spill and tagged 2010 gulf of mexico oil spill, advertise, golf of mexico oil spill, Golfo de México el derrame de petróleo, Gulf of Mexico Oil Spill 2010, Ixtoc Oil Spill, mexico gulf oil spill, mexico oil spill, oil gulf of mexico, oil spill gulf of mexico, oil spill gulf of mexico 2010, oil spill in gulf of mexico, oil spill in the gulf of mexico, oil spill in the gulf of mexico 2010, oil spills in the gulf of mexico, the gulf of mexico oil spill. Bookmark the permalink.